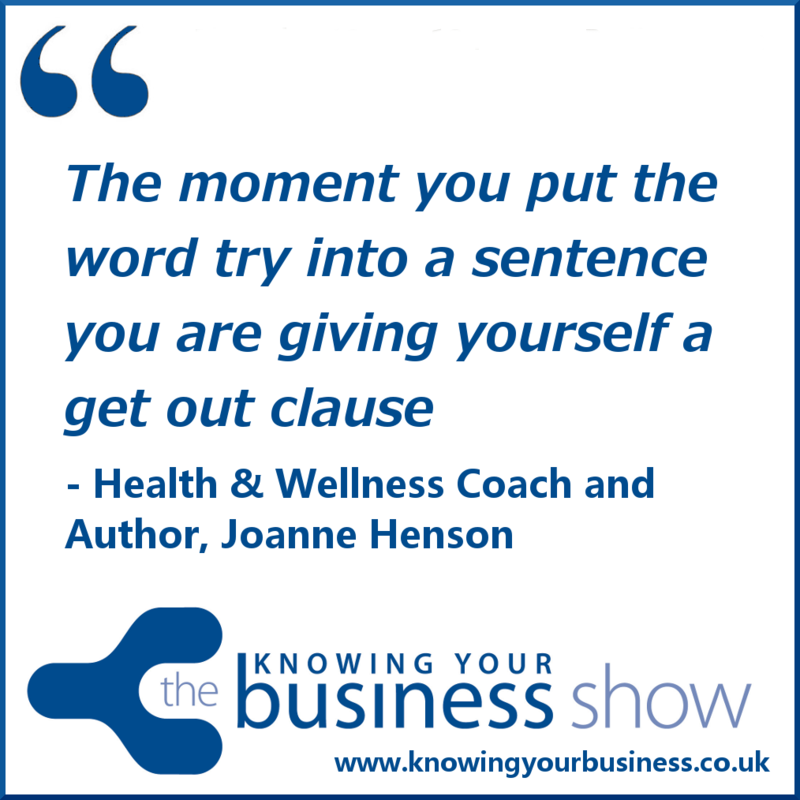 On this show we asked health & wellness expert Joanne Henson – how can individuals transform their New Year resolution from thinking about becoming more healthy, into an exciting new reality? Statistics vary, but most estimates put the success rate for New Year Resolutions at around 10%. That’s a depressing 9 in 10 chance of failure. So how can you make sure you’re one of the successful 10% this year? This show was broadcast live on Radio Horton 27th November 2014. You can hear this enthralling interview with Joanne further down the page on podcast. Apart from speaking with Joanne live on radio, we also asked her to send us 8 top tips towards helping you achieve your health and wellness goal. Are you planning a fresh start in 2015? Are you going to eat more healthily, exercise regularly or lose weight? If you have answered yes, then these top 8 tips are just perfect for your health and wellness success. If you don’t define exactly what you want, how will you know when you’ve got it? Want to lose weight? How much? Want to get fitter? How much fitter? In three/six/twelve months’ time, what do you want to be able to do? Run a marathon, or run in a 5k charity run? Write it down. Then write down the date by which you want to reach your target. Without a deadline you’ll drift: what’s another day of not working towards your goal if there is no deadline? If you’re aiming at a specific date you can plan accordingly. Once you’ve got a target and a deadline you can plan the steps you need to take to get you from where you are now to where you want to be. Without planning, things go awry. Here’s an example: you know you want to fit in three workouts in a week, but you’ve not planned when. Monday night comes along and you’ve got that Monday feeling, so you say to yourself you’ll go to the gym tomorrow. But you then realise you’re meeting friends on Tuesday, which means no workout, and you’re going away at the weekend, so opportunities to fit in your three workouts are disappearing fast. If you’d looked ahead and diarised those workouts, this wouldn’t have happened. Treat your New Year Resolution as a project and put a plan in place. Ask yourself is your goal actually possible, with the time and resources you are able and willing to dedicate to it? For instance, if you want to lose a stone, and you’re giving yourself six weeks, that’s six weeks of pretty strict eating. But do you actually want to be so strict? Would you rather give yourself eight weeks and allow yourself a few nights out and treats along the way? It’s great to set ambitious goals, but not so great if you’re setting yourself up to fail. Give yourself a realistic target and you’ve got far more chance of achieving it. Think about creating a journal or spreadsheet or download an app which you can use to record progress – you may only be recording small improvements, but they’re improvements nonetheless, and they’ll add up to one great big improvement if you stick at it. And when your willpower is waning, looking back at the improvements you’ve made so far will help you stay on track. Don’t let one slip up turn into the end of your plans. If you’ve had one unhealthy meal it’s not going to undo all the healthy eating you’ve done so far this year, and if you’ve missed a workout or two, there’s always next week to get yourself back to the gym and catch up. Don’t get so angry at yourself for one lapse that you forget to congratulate yourself on the success you’ve had up to that moment. Remind yourself of your successes so far, and put that one bad day in proper perspective. After a bad day, just make the next day a good one, and you’ll be back on track. Coaches often say, “Begin with the end in mind” – successful goal setting is all about visualising the end goal. But what is even more important is to progress with the end in mind. Remind yourself daily what you are aiming at and remind yourself daily why you want it. Focus on how great it’s going to feel when you get there – the smaller size jeans, the increased energy, the compliments on how great you’re looking, the satisfaction of completing a race. It’s these thoughts which will keep you on track. Many resolutions are about giving things up, so it’s very easy to talk about them in negative terms: “I am giving up alcohol for January”, “I am not eating chocolate”, or “I am going to stop procrastinating”. But all of these things have a positive end – a healthier you, a leaner you, a more effective you. If you talk only about what you are giving up, you are bound to feel deprived. Try to replace negative statements with more positive ones – for instance instead of “I’m not drinking for the whole of January” say “I’m having a healthy January to improve my energy levels”. This shifts the focus from what you are missing to what you are looking forward to. What statements do you make about your resolutions which highlight negatives and deprivation? How can you turn them into positives? If you make the same old resolution every year, this is particularly important. If something hasn’t worked for you before, it’s unlikely to work this time around. For instance, if you’ve started the last three years by joining a slimming club, lost some weight initially and then gained it all back again, why do you think things will be different this time around? Try a new approach. What can you do differently this year? Get advice if necessary, or ask successful people how they achieved their goals. For weight loss, ditch the quick fix diets and consider other ways of eating. If you want to get fit, but start off every year with a few runs, only to lose interest the first time it rains, what other forms of exercise could you do instead? If you adopt these strategies in 2015 you’ll have a practical and realistic strategy for success. Here’s to you being in the successful 10% this year! 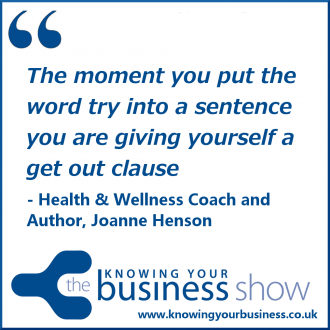 In this 1:53 second snippet we hear Joanne Henson explain the power of negative language. And what to do instead. Joanne highlights in this 1:53 second snippet there are hundreds of different forms of exercise you can take part in. Find something you actually enjoy doing is the key to Health & wellness success. You can hear the full engrossing conversation with Joanne Henson right here. Meaningful and permanent change comes when you take ownership of your own situation and ambitions and Joanne can support you in this. If you have any questions for Joanne, or would just like to leave a comment, please do.